Thanksgiving is a time of reflection - on our lives, our families, our friends, and our clients. As we reflect, we are filled with gratitude for each of you and wish you all a Happy Thanksgiving! As is tradition, sharing our recipe collection continues. This year we present our Favorite Soups. These can be found by clicking Our Recipe Collection, above. You can then follow the link to see recipes from past years. 'Placemaking’ is both an overarching idea and a hands-on tool for improving a neighborhood, city or region. It has the potential to be one of the most transformative ideas of this century. Read more about how changing focus changes everything. From the dawn of humanity, when Homo sapiens first began walking upright, they have always been a group of dedicated party animals. Life was hard in those days, what with fighting off cave bears and saber-toothed tigers. The Ice Age made modern winters look silly. Food was hard to come by. There was no such thing as walking down to the market. It was a rough existence. Any excuse for a celebration was welcome. Well, we have a good excuse for celebrating - the 25th Anniversary of Lehman & Lehman, Inc. 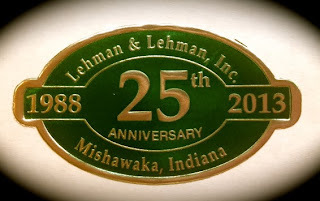 Since December 7, 1988, Lehman & Lehman has had the privilege of "Transforming Horizons" throughout Indiana and the Midwest. Many of our clients have been with us from the beginning. Some are just discovering what we, as Landscape Architects, Urban Planners and Placemakers, can do for you. Whatever the scope of our relationship we know that we would not be celebrating 25 years without you and we take this time to thank you for the trust you have placed in us and the relationships we enjoy. Thanksgiving is the perfect time to express gratitude...to our families and our friends, our clients and our colleagues. We are thankful for our conversations and collaborations, our work and our play. God has truly blessed us and for that we give thanks. Our holiday tradition of sharing recipes continues! Our most requested pie recipes can be found by clicking Our Recipe Collection above. You can then follow the link to see past recipe collections.